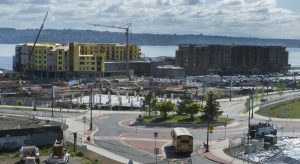 Nestled along Commencement Bay and flanked by Tacoma on three sides, Ruston resides as a pearl. The City of Ruston is a quaint and vibrant example of small town America. Ruston is a city steeped in pre-Washington State history with deep roots and families that have lived there for generations, including the Puyallup Indian Tribe who inhabited the general Commencement Bay area and used its shores to fish. From its inception as a camp along the shores of Commencement Bay, Ruston grew into a town built on the smelting industry that has evolved into the present self sustaining City of Ruston. With a 2010 population of 749 (US Census) and estimated 2035 population of 1,608, Ruston is primarily a residential community. Welcoming neighborhoods offer arts and crafts style homes and porches along traditionally scored sidewalks with landscaping. 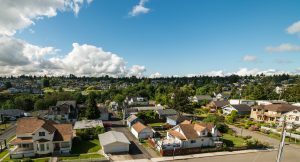 Spectacular scenic views of Puget Sound and the Olympic Mountain Range are abundant from neighborhoods, commercial areas, and nearby Point Defiance Park. Ruston residents enjoy common open space including, parks, trails and a community center. Winnifred Street and 51st Street is the local heart of Ruston. This area plays host to civic buildings, park land, public gathering places, community celebrations, festivals, block parties and the like. More than half of the 97-acre $1.2 billion urban village project, including the huge parking garage in the foreground, lies within Ruston. On the Tacoma side in the background, is the Century Building, which will house a nine-screen theatre, and the Copperline apartment complex. Photo taken in Ruston on Wednesday, April 22, 2015. Land naturally slopes down to the shores of Commencement Bay where new residential and commercial development is occurring. This area, formerly known as the American Smelting and Refining Company (ASARCO) site, opened in the late 1880s has ceased operations and vacated. In accord with federal clean up, the area is now home to a developing community of mixed uses, including multifamily residential, commercial, and recreational opportunities.